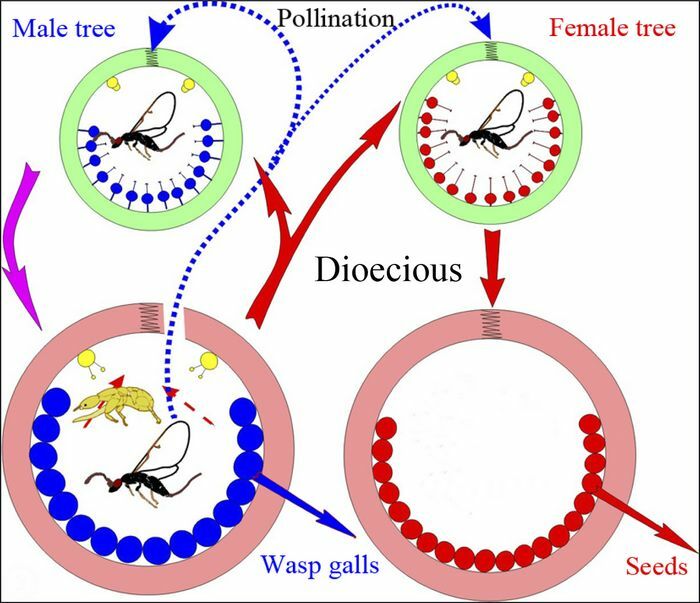 In dioecious species the female and male reproductive functions are separated between individual trees. Male trees produce figs containing florets that all have a short style length (blue flowers in the diagram below). The pollinating fig wasp is thus capable of reaching all the ovules with her ovipositor and hence manages to lay eggs in all the flowers. These then produce wasps which load up pollen before they leave the fig they have bred in. These figs therefore perform the male reproductive function. Female trees produce figs that all have a long style, preventing the pollinator from reaching the ovules with her ovipositor which is much shorter than the style length. She does however, pollinate the stigmas in the process of attempting to lay her eggs. These flowers set seed performing the female reproductive function for the species. Figs on female trees are traps for the wasps as they do not manage to reproduce. The reason why the fig wasps do not learn to avoid female figs is that they are fooled into entering the fig as a result of the exact mimicking of male figs (size, colour and most importantly the chemical cues or volatiles that the pollinators home in on). Illustrations and photographs © Simon van Noort (Iziko Museums of South Africa) and Jean-Yves Rasplus (INRA).